Each year, Camden Catholic High School senior Madison Smith dedicates hours of her busy life to putting together a fundraiser for the Susan G. Komen Foundation of South Jersey. This year’s event was Saturday, Jan. 30. In 1980, Nancy G. Brinker promised her dying sister, Susan, she would do everything in her power to end breast cancer forever. In 1982, that promise became the Susan G. Komen organization and the beginning of a global movement. What began with $200 and a shoebox full of potential donor names has developed into $2.6 billion in groundbreaking research to fight breast cancer. Thanks to folks such as Smith, the efforts of the foundation have helped reduce death rates from breast cancer by 34 percent since 1990. “My great grandmother was a survivor, so the cause had meaning to me,” Smith said. She was also used to playing in pink AAU basketball tournaments during her younger years, as she was involved with Mount Laurel Basketball from kindergarten through eighth grade. “I remember them being fun and feeling like I was contributing to a cause through my sport, so I wanted to pass that (feeling) along to other girls,” Smith said. In 2014, Smith was looking for a fun way to get service hours and make an impact on the community at the same time. She came up with idea of the Pink Out and decided on Susan G. Komen as the recipient of the money raised because it was a relatively new foundation that raised awareness for breast cancer. It also helped that her father Frank is the director of girls travel basketball in Mt. Laurel, so he played an instrumental role in giving the idea some legs. It quickly became a large fundraiser and the only day of the season all Mt. Laurel travel teams play at home. The girls all come in the night before and decorate the gym with balloons and posters. 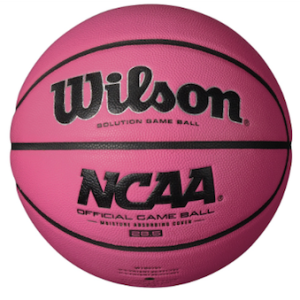 They also make some adjustments to the games by wearing pink uniforms and playing with pink nets. “I think the girls look forward to it, so we get different uniforms and socks and tee shirts each year,” Smith said. Everyone who attends is given the opportunity to buy raffle tickets for a basket. Smith reaches out to local businesses beforehand and accumulates gift baskets to use as giveaways. This is where most of the proceeds for the Susan G. Komen Foundation are raised. Local companies such as Perkins in Moorestown, Wegmans in Mt. Laurel and Third Base Sports in Cherry Hill make donations to the event every year. With the help of these businesses and the former Mount Laurel Basketball players who come back and lend a hand, the fundraiser has grown significantly.